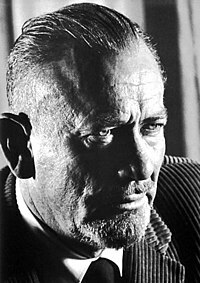 John Steinbeck was an American writer. He was born on February 27, 1902 in Salinas, California, and died on December 20, 1968 (aged 66) in New York City, New York. He was of German, English, and Irish descent. He married Carol Henning in January 1930. They divorced in 1941. In 1942, he married Gwyndolyn Conger. They had two sons. In June 1949, Steinbeck met Elaine Scott. In December 1950, Steinbeck and Scott married. This third (and final) marriage for Steinbeck lasted until his death in 1968. His books include The Red Pony, Of Mice and Men, East of Eden, The Grapes of Wrath (1939 Pulitzer Prize for Fiction), and The Winter of Our Discontent (1962 Nobel Prize for Literature). In September 1964, Steinbeck was awarded the Presidential Medal of Freedom by President Lyndon B. Johnson. This page was last edited on 24 February 2019, at 21:46.